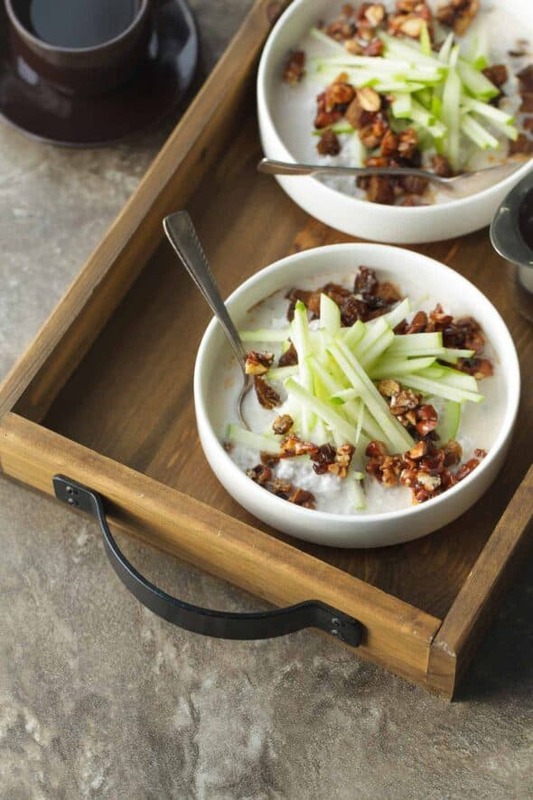 Start your day with a bowl of this easy overnight paleo and vegan maple cinnamon bircher muesli. If you tend to skip breakfast because you’re too tired or too rushed most mornings then you’ll want to try bircher muesli. 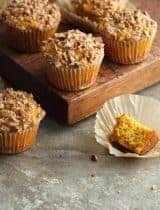 It’s a quick and simple, but filling breakfast you prepare ahead of time so it’s ready to go when you are. 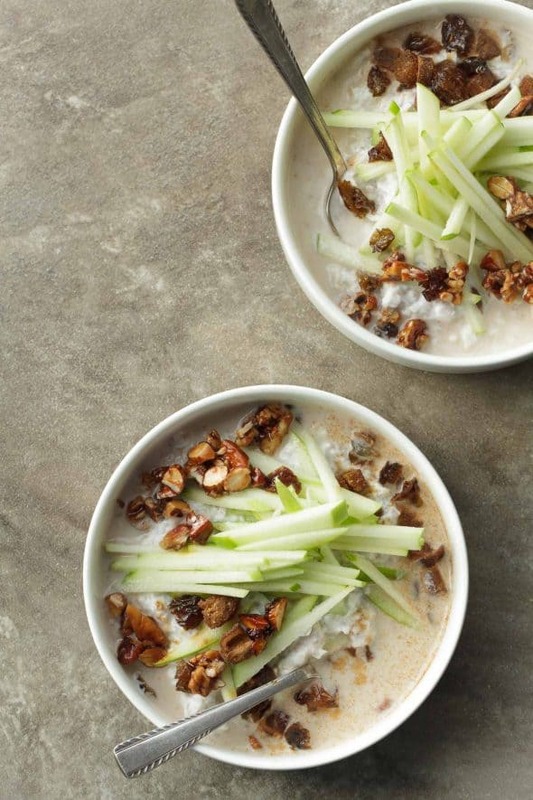 Bircher muesli is thick and hearty and loaded with dried fruit, nuts and apple. 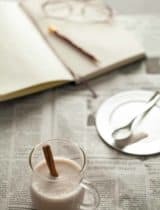 It’s an ideal breakfast for busy mornings since everything can be prepped the night before and easily adapted to what you have on hand. Now traditional bircher muesli is made with oats that are soaked overnight in some combination of milk, yogurt and/or apple juice but mine starts off with shredded coconut instead. The coconut flakes are roughly chopped into oat sized pieces then combined with chia seeds and coconut yogurt and left to soak overnight. 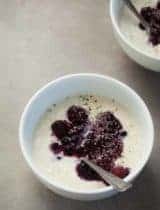 The overnight soak makes the coconut pieces tender and chewy like oatmeal and the chia seeds and yogurt create a creamy porridge-like consistency. From there you add a finely chopped or grated tart apple tossed with a squeeze of lemon juice and a generous amount of dried fruit and nuts. You can use any combination you’d like but I’m partial to raisins and dates mixed with lightly glazed almonds and pecans at the moment. 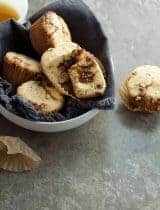 I chop and roll the dates in maple sugar with a dusting of cinnamon and coat the nuts with a cinnamon maple glaze as well for a sweet and spicy note that’s perfect for fall. 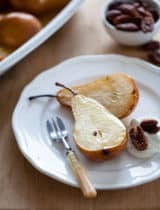 Both the fruit and nuts can be prepared the night before along with the pudding so all you’re left with is a bit of assembly the next morning; make a big batch of each and have breakfast taken care for a few days. 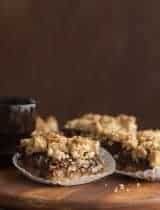 Sweeten it as you please with extra maple syrup and serve it with almond milk. 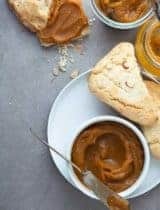 Each bite is creamy, chewy and crunchy with the sweet/tart flavor of apples, maple and cinnamon. It’s a good way to start the day. Place the chopped coconut, chia seeds, yogurt and water in a large bowl and mix well to combine. Cover and refrigerate overnight to soak. Toss the julienned apple with lemon juice. Place in an airtight container and refrigerate overnight. 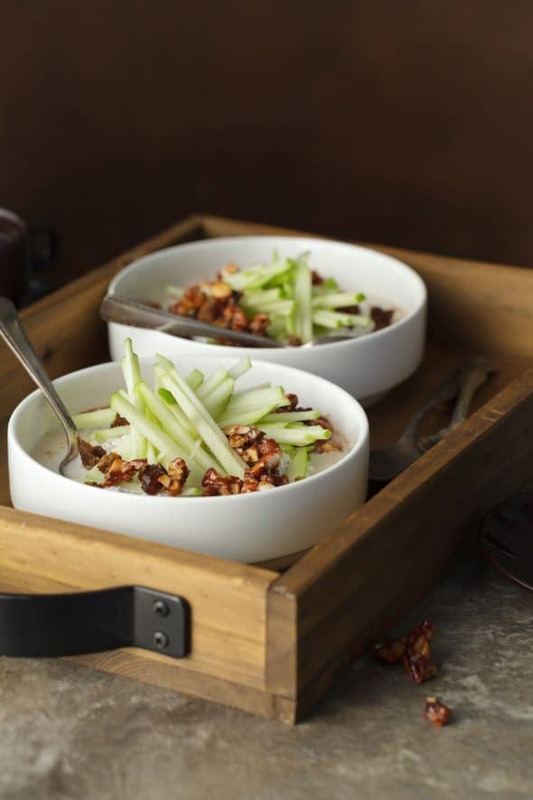 To serve, divide the coconut chia mixture between bowls, top with julienned apple, glazed nuts, rolled dates and raisins. Serve with almond milk and extra maple syrup on the side.